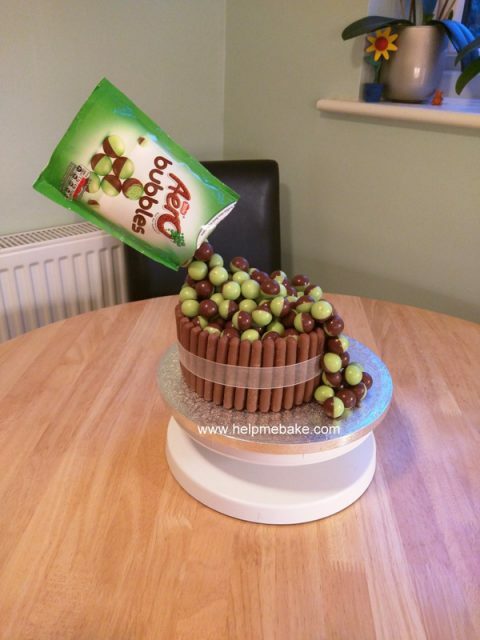 This is the Aero bubbles gravity defying cake that I have been working on today, it is a chocolate cake covered in chocolate fudge icing, then surround by fingers and then topped with Aero Bubbles. 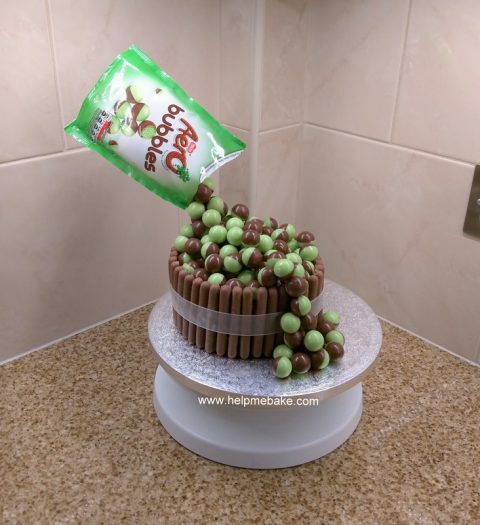 To make the ‘gravity defying’ bit simply insert a dowel or thick straw at an angle into the cake, put some melted chocolate on it and then stick your aero bubbles to it in stages, you will need three to four at a time and start building them up in like a pyramid shape. Ensure your chocolate is set otherwise they will fall off which a few of mine did but don’t worry you can taste test those ones later! Continue this process allowing your chocolate to dry each time until you reach you required height. I then wrapped cotton wool balls in clingfilm and inserted them into the aero packet so that it looked open. I then carefully sat the bag on the end of the dowel thus giving the effect that the aero bubbles are being poured from the packet. I have posted two pictures so that you can see the warming colours on one and the gravity effect on the other. In future I would use a black ribbon instead of white as it would have looked better. I couldn’t change it as I had stuck the aero bubbles over the ribbon.